From Peckham Vision Facebook: The Old Cycle Club in Peckham will host The Drawing Room, an exhibition showcasing a selection of contemporary works on paper including limited edition prints, photographs and drawings. Monday 7th April by appointment only. The Old Cycle Club, 93 Choumert Road, SE15 4AP. 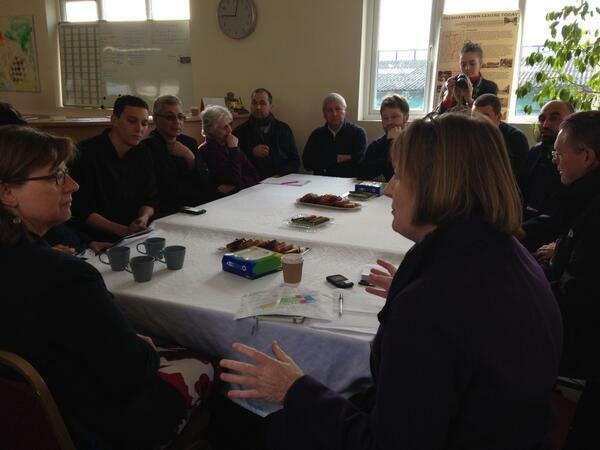 From Peckham Vision Facebook: Harriet Harman MP yesterday met several businesses affected by Network Rail’s Station Gateway plans; the meeting was in the office of Copeland Park (owners of the Bussey building). There was a useful discussion about the issues they face from the uncertainty that Network Rail are issuing notices for eviction by December, even though the recent decisions mean the plans are being reconsidered. We suggested a regular news email to improve information and communications. This was implemented swiftly by Harriet’s office, and an email news update was issued to their mailing list after the meeting. See copy below. They have promised to make this a biweekly update. Before the meeting we had a walk around central Rye Lane with Harriet to show key buildings and where they fit in the overall local economy. From Peckham Vision Facebook: Bussey building/CLF Art Cafe, 133 Rye Lane THURSDAY 20 MARCH 12 midday to 2am – Art, Music, Politics Must Meet: full day festival. Art Works, DJ sessions, Workshops, Performances, Music, Poetry, Film Theatre + Video Crit, Open Discussions. A.M.P. is an experiment, a research project, and utopian initiative to bring practices of Art, Music and Politics together in re-imagining our society, and developing radical culture… realise how these practices each interact with their own limitations, potential … and the roles they play in the forming of culture and community … https://www.facebook.com/events/710656972319673 During the day, a workshop from 6-8pm: topic this year is the role cultural workers’ play in gentrification. While much of the discussion around this issue has emphasised cultural workers’ lifestyle choices as the driving force of the process, we would like to emphasise wider, structural, political, and economic aspects to gentrification. We hope the workshop can be a space where personal experiences can be contextualised and provide a platform for cultural workers to contribute meaningfully to community struggles around increasing rents, the loss of local businesses, and omnipresent policing. The Peckham Liberal Club (PLC) was saved from sale and demolition last October when it was registered as a community asset. It is a wonderful historic asset with amazing facilities as a social and cultural venue for all kinds of activities. It is right in the area around the station which is becoming a significant destination for cultural activities of a wide variety. So now is your chance to join the Peckham Liberal Club to help shape its future! Just £20 a year. The AGM for members only is on Sunday 30th March at lunch time.